Vancouver, January 17,2019--Fortuna Silver Mines, Inc. (NYSE: FSM) (TSX: FVI)is pleased to announce fourth quarter and full year 2018 production figures from its two underground operating mines, the San Jose Mine in Mexico and the Caylloma Mine in Peru. For the full year 2018, the Company produced 8.9 million ounces of silver and 54.2 thousand ounces of gold or 12.8 million Ag Eq1 ounces. In the fourth quarter of 2018, the San Jose Mine produced 1,718,496 ounces of silver and 11,825 ounces of gold, 9 % and 4 % below budget respectively. Average head grades for silver and gold were 230 g/t and 1.58 g/t, 6 % below budget and in line with budget respectively. Silver and gold production for 2018 totaled 7,979,634 ounces and 53,517 ounces respectively; being 7 % and 11 % above the mine’s annual guidance. Average head grades for silver and gold were 260 g/t and 1.75 g/t, 8 % and 12 % above the mine´s annual guidance respectively. 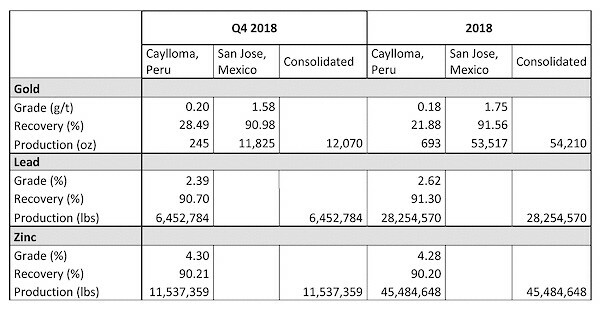 In the fourth quarter of 2018, the Caylloma Mine produced 219,207 ounces of silver, 5 % above budget. Average head grade for silver was 61 g/t, 5 % above budget. Silver production for 2018 totaled 911,309 ounces; 11 % above the mine’s annual guidance. 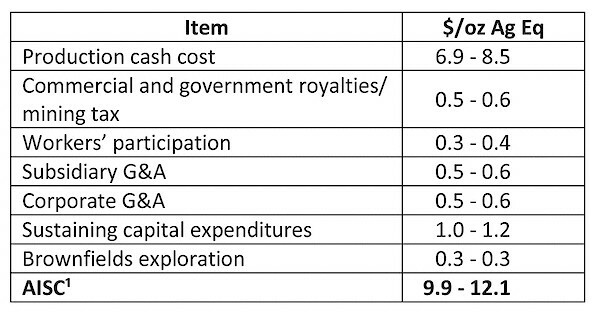 Average head grade for silver was 63 g/t, 10 % above the mine’s annual guidance. In the fourth quarter of 2018, lead and zinc production was 6,452,784 pounds and 11,537,359 pounds respectively, 2 % below budget and 2 % above budget respectively. Average head grades for lead and zinc were 2.39% and 4.30%, 2 % below budget and 2 % above budget respectively. Base metal production for 2018 totaled 28,254,570 pounds of lead and 45,484,648 pounds of zinc; 10 % and 2 % above the mine’s annual guidance, respectively. Average head grades for lead and zinc were 2.62% and 4.28%, 9 % and 2 % above annual guidance respectively. San Jose plans to process 1,059,000 tonnes of ore averaging 247 g/t Ag and 1.66 g/t Au. Capital investment is estimated at $12.7 million; including $8.3 million for sustaining capital expenditures and $4.3 million for Brownfields exploration programs. Caylloma plans to process 535,500 tonnes of ore averaging 64 g/t Ag, 2.53% Pb and 3.87% Zn. Capital investments are estimated at $11.4 million; including $9.8 million for sustaining capital expenditures, $0.8 million for non-sustaining CAPEX, and $0.8 million for Brownfields exploration programs. Based on the successful infill drilling campaign completed in 2018 (refer to news release dated September 6, 2018 “Fortuna updates on infill drill program at the Lindero gold Project in Argentina”), Fortuna is currently conducting an updated internal estimate of Mineral Reserves with the intention of optimizing the mine plan for Year One. Based on preliminary study results, such updated technical information will not materially change the existing global Mineral Reserve estimate. The Company plans to provide a comprehensive update on Lindero construction progress and Year One production optimization study in early March 2019. The Brownfields exploration program budget for 2019 at the San Jose Mine is $4.3 million, which includes 11,500 meters of diamond drilling and 450 meters of underground development for drilling access and platforms. Exploration drilling will focus on the sub-parallel Victoria mineralized zone. The Arizaro gold-copper porphyry target lies within the Lindero Project concession block. In 2019, the Company plans to further evaluate the results of the 2,180-meter drill program completed at Arizaro in 2018 and investigate the economic potential of including Arizaro mineralization into the existing Lindero resource. Exploration work on the Tlamino Project in 2019 will consist of maiden metallurgical testing on the mineralized material intersected in the 2018 Barje Project drill program and approximately 4,000 meters of diamond drilling on the Barje and Karamanaica Targets (see Medgold news releases dated June 11, 2018, June 18, 2018, July 5, 2018, July 18, 2018, September 20, 2018 and November 19, 2018). Fortuna retains the right to earn a 51 % interest in the Tlamino Project by spending $3.0 million by March 2020, and gain an additional 19 % interest by spending a further $5.0 million and completing a preliminary economic assessment by March 2023. Through an aggregate C$2.6 million equity investment in Prospero Silver Corp. (TSX.V: PSL), Fortuna funded a Strategic Alliance with Prospero (see Prospero Silver news release dated April 17, 2017, May 9, 2018, September 6, 2018). This strategic alliance provided for the initial drilling of multiple targets at Prospero’s Matorral, Petate, Pachuca SE, Buenavista and Bermudez properties located in Durango, Hidalgo and Chihuahua States. High-level epithermal clay alteration with anomalous gold, silver or pathfinder elements are present at each property, none of which has been previously drilled. Drilling at all five projects was completed in 2017 and 2018 and Fortuna selected the Pachuca SE Project as its selected property (see Prospero silver news releases dated August 24, 2017, September 18, 2017, November 8, 2017, January 10, 2018, January 25, 2018, March 14, 2018, March 29, 2018, May 9, 2018, May 30, 2018, September 8, 2018 and December 10, 2018). The parties are currently preparing the definitive option agreement. The Pachuca SE Project option agreement will give Fortuna the right to earn up to a 70 % interest by spending $8 million over six years and completing a preliminary economic assessment. The Company is revisiting the extensive reconnaissance exploration database comprising over fifteen years of sampling and generative work in northern Argentina, acquired from Goldrock Mines along with the Lindero Project in 2016. In addition, the Company intends to continue the evaluation of new opportunities on third-party properties. Amri Sinuhaji, Technical Services Director, and David Volkert, Vice President of Exploration, are the Qualified Persons for Fortuna Silver Mines Inc. as defined by National Instrument 43-101. Mr. Sinuhaji is a Professional Engineer registered with the Association of Professional Engineers and Geoscientists of the Province of British Columbia (#48305) and is responsible for ensuring that the production and guidance information contained in this news release is an accurate summary of the original reports and data provided to or developed by Fortuna Silver Mines and he has reviewed and approved such scientific and technical information contained in this news release. Mr. Volkert is a Professional Geologist registered with the Association of Professional Engineers and Geoscientists of the Province of British Columbia (#191936) and is a certified Professional Geologist with the American Institute of Professional Geologists (#10759) and is responsible for ensuring that the Brownfields and Greenfields exploration information contained in this news release is an accurate summary of the original reports and data provided to or developed by Fortuna Silver Mines and he has reviewed the exploration data underlying the exploration information contained herein. Mr. Volkert has reviewed and approved such scientific and technical information related to the Brownfields and Greenfields exploration information contained in this news release. This news release contains forward looking statements which constitute “forward looking information” within the meaning of applicable Canadian securities legislation and “forward looking statements” within the meaning of the “safe harbor” provisions of the Private Securities Litigation Reform Act of 1995 (collectively, “Forward looking Statements”). All statements included herein, other than statements of historical fact, are Forward looking Statements and are subject to a variety of known and unknown risks and uncertainties which could cause actual events or results to differ materially from those reflected in the Forward looking Statements. The Forward looking Statements in this news release may include, without limitation, statements about the Company’s plans for its mines and mineral properties; the Company’s business strategy, plans and outlook; future operating performance such as the Company´s production forecasts and plan; the merit of the Company’s mines and mineral properties; mineral resource and reserve estimates; timelines; the future financial or operating performance of the Company; expenditures; approvals and other matters. Often, but not always, these Forward looking Statements can be identified by the use of words such as “estimated”, “potential”, “open”, “future”, “assumed”, “projected”, “used”, “detailed”, “has been”, “gain”, “planned”, “reflecting”, “will”, “containing”, “remaining”, “to be”, or statements that events, “could” or “should” occur or be achieved and similar expressions, including negative variations. Forward looking Statements involve known and unknown risks, uncertainties and other factors which may cause the actual results, performance or achievements of the Company to be materially different from any results, performance or achievements expressed or implied by the Forward looking Statements. Such uncertainties and factors include, among others, changes in general economic conditions and financial markets; changes in prices for silver and other metals; technological and operational hazards in Fortuna’s mining and mine development activities; risks inherent in mineral exploration; uncertainties inherent in the estimation of mineral reserves, mineral resources, and metal recoveries; changes to current estimates of mineral reserves and resources; changes to production estimates; governmental and other approvals; political unrest or instability in countries where Fortuna is active; labor relations issues; as well as those factors discussed under “Risk Factors” in the Company's Annual Information Form. Although the Company has attempted to identify important factors that could cause actual actions, events or results to differ materially from those described in Forward looking Statements, there may be other factors that cause actions, events or results to differ from those anticipated, estimated or intended. This news release also refers to non-GAAP financial measures, such as all in sustaining cash cost; cash cost per tonne of processed ore. These measures do not have a standardized meaning or method of calculation, even though the descriptions of such measures may be similar. These performance measures have no meaning under International Financial Reporting Standards (IFRS) and therefore, amounts presented may not be comparable to similar data presented by other mining companies.